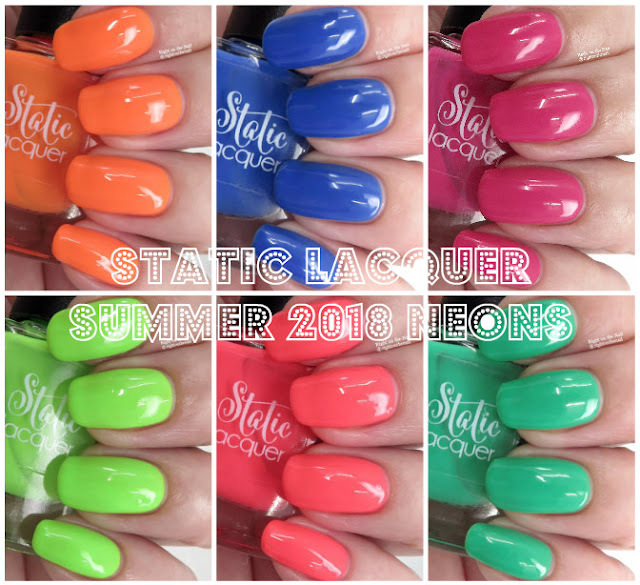 The collection will release this Sunday, July 29th in the Static Lacquer site for $10 each or $46 for the whole collection. Neons are notoriously hard to capture, but I did my very best to show these as color accurate as possible. Without further ado, let's do this! I usually mention this on each individual polish, but since these applied the same, I figured I'd just mention it here. I used 3 thin coats for every polish with Tropic Like It's Hot being the sheerest (the orange one). I didn't need to use undies for any of these, and if you see any visible nail line, it's from the bright lights. Stacy calls them creams, but they look at a bit squishy like a jelly polish to my eye. I found it best not to overwork these, otherwise you'll make it look streak. Just have a healthy amount on the brush and let it glide across the nail and they'll look perfect. They dry with a bit of a satin finish due to the neon pigment, so make sure to add a topcoat for that shiny finish. Love it! Up first we've got Freeways Like Paradise which is a neon fuchsia purple cream. This one is most difficult to photograph, and it's definitely more purple in real life. Caught in the Undertow is a neon blue cream with a hint of purple in there. Stars & Satellites is a green-based highlighter yellow cream. Eye searing and I love everything about it. I Can See the Sunset is a neon coral cream. A perfect color for any skintone! You guys know I love orange! SQUEE!! 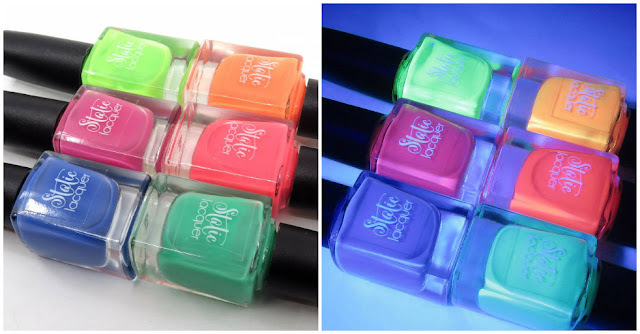 The bottom photo shows it with the Overcast matte topcoat which gives it a whole new look. And last but not least we have Time Won't Change It which is a blue-toned green cream. I am terrible at nail art, so I didn't get to watermarble with them, but Manna's Manis did an awesome job with hers. What an exciting set of colors! My top recommendations are Stars & Satellites, The Afterglow, and I Can See the Sunset. You can't go wrong with any of them, and if you buy the whole set for $46, you'll save a whopping $14! Set your alarms for this Sunday to get your set. You can learn more about Static Lacquer on their website, Facebook, Group, and Instagram pages.